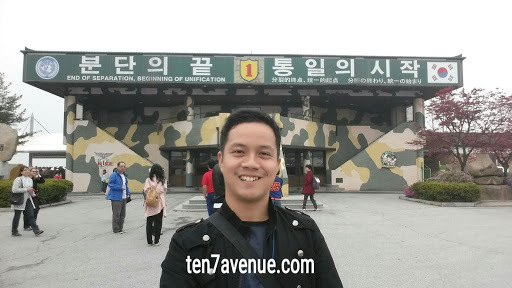 A different way to experience South Korea is to visit the Demilitarized Zone or known as the DMZ. 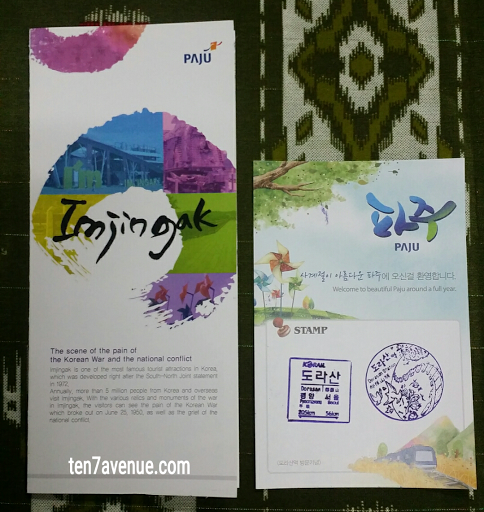 It is located at Paju, Northeastern part of South Korea. It is one of the boundaries of the North and South Korea wherein during the Korean War, the place is one of the battlefields. 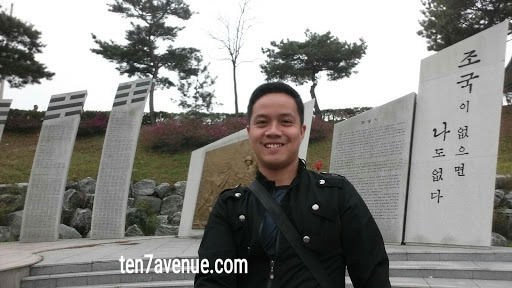 This place is witness to the pain of the Korean War and the national conflict. Many of its relics and monuments serve as remembrance of the past and the strive for an everlasting peace among the countries. A day prior the tour, I have asked my friend to book me for the tour and gladly i am reserved. It costs around KRW 46,000. 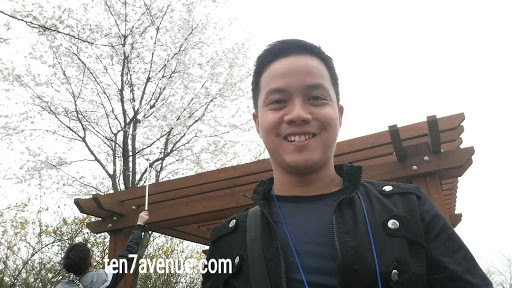 The pick up area for a joiner like me is near the Hongik University Station bus stop. There is excitement and anxiousness in my mind knowing that I will be visiting the boundary of North and South Korea. Some question like, "Am i really going to this? Am i really in the right state of mind visiting the place? Will I still go back home safely? ", afloat in my mind. 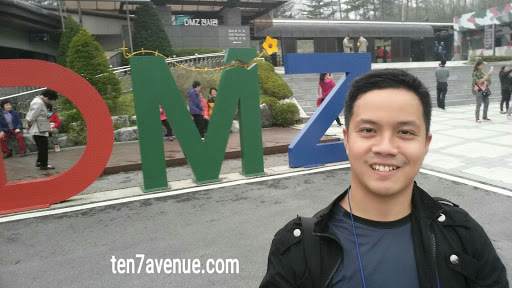 It is because some blog posts say that there are restrictions in what to wear and how to behave when in the DMZ - since North Koreans might be taking some photos of tourists from afar or by a drone and will show to their citizens how people dress outside their country. 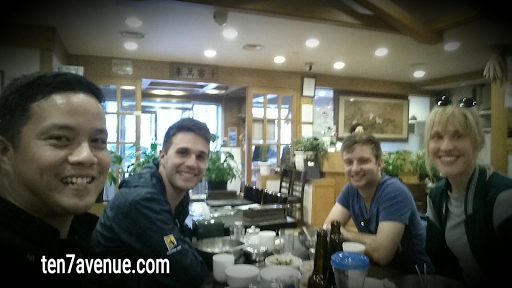 Anyways, that is part of the adventure when in South Korea! 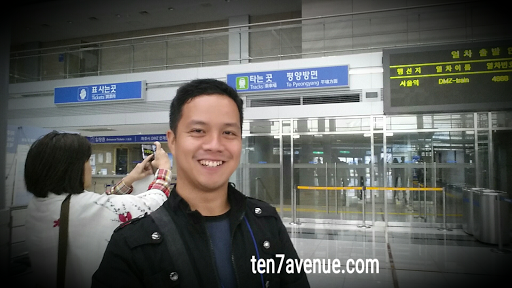 From Hongik University Station to DMZ is almost an hour tour bus ride. While I am containing my excitement towards our destination, I am still looking for those late bloomer sakura through the window... Hoping to see either white or pinkish sakura! Anyways, first stop is at the DMZ ticket booth and tourist information center. 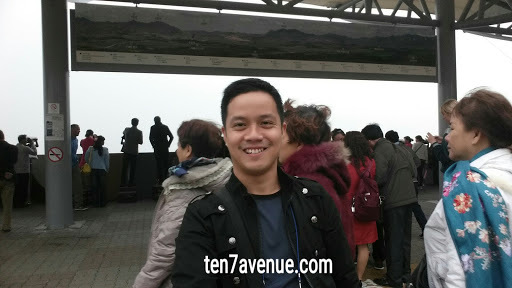 Tourists are given only a few minutes to take some photos and tour around the area with a constant reminder of wearing the tour ID. In the vicinity, you will see the Bell of Peace. 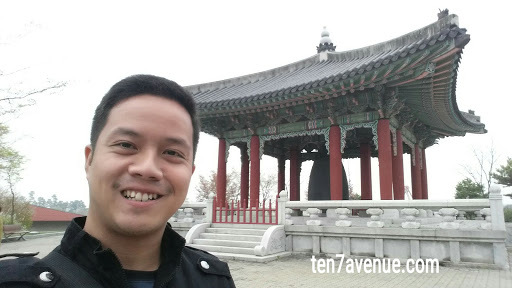 It is a very huge bell that represents peace of mankind and unification of the Korean nation in the new millennium. 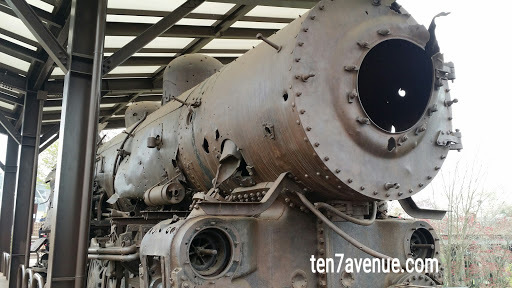 Just some meters away, you will see a Steam Locomotive at Jangdan Station of the Gyeongui Line. It is such a huge old steam-run train derailed by explosions of bomb, aside from that, the train is bathed by traces of explosion - it is so tragic to imagine. Then, a few meters away again, you will see the Bridge of Freedom. It is a wooden bridge made to free more than 10,000 prisoners. At the end of this bridge, you will see some flags or some cloth tied that symbolizes territory and grief of the area during the Korean War. After few minutes, we get back to the tour bus the we proceed to our closest distance to North Korea. 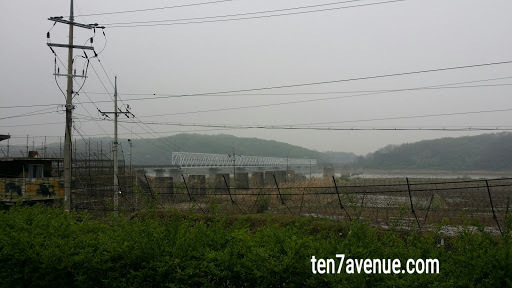 We pass through the Imjingang Railroad Bridge towards the DMZ observatory and the 3rd tunnel. It is said that the North Koreans tried to dig tunnels towards Seoul. 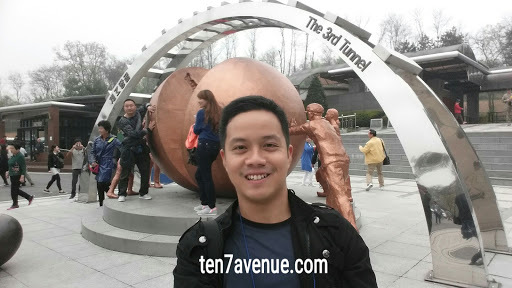 Several tunnels are discovered and one of it is the 3rd tunnel that is now part of the history and tourist attraction. Tourists are invited to watch the film showing about the tunnels and then try to walk down the tunnel which I think is a kilometer away to experience and witness some discoveries in the tunnel. Tourists are urged just to walk in their own pace with helmet on and devices kept in the lockers provided. I suggest that no claustrophobic individual will try to enter... At the end of the tunnel, you will just witness a boundary between the two Korea then back to the surface. You will feel peace and tension at the same time since there are military personnel from South Korea and also some ally armies from the USA. 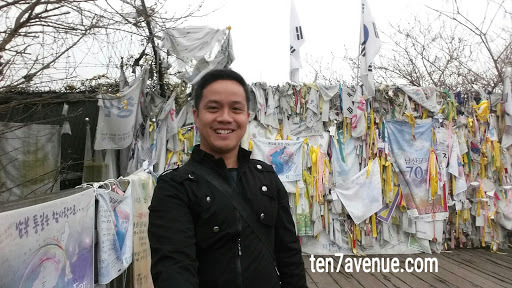 Never miss to have that photo opportunity with the bean like landmark at the DMZ, for me, it symbolizes mending of ties between two Korea. Then, we proceed to the observatory. Some young South Korean military forces are there to man the boundary. Tourists are restricted to take photos beyond a designated yellow line. There are some binoculars you can coin in to peek a view in the nearby North Korea. It is foggy then, no clear image is seen but at least I manage to seen a part of North Korea - a vast area with some industries but less to no people around. There you go, the experience is fun for a half day tour. 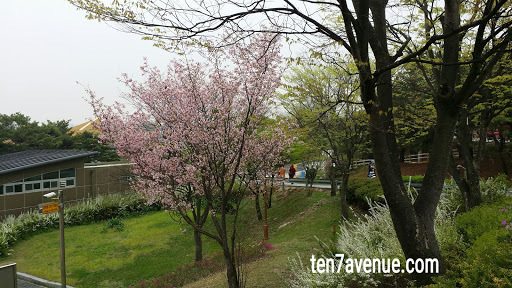 More pleasant since I saw the sakura, some late blooming sakura in Paju!!! In the tour bus, different nationalities are there and glad to befriend some of them. 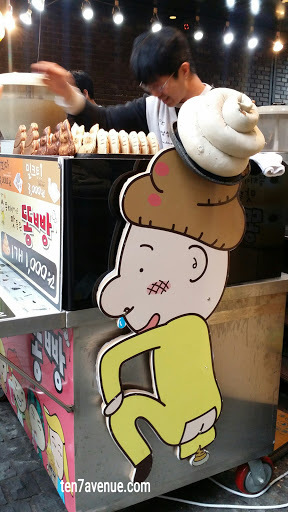 Going back to Seoul, we take some time in a ginseng museum, you will really need not to miss it! (Sarcastic attitude!!!) Then, some new friends and I look for a place to eat lunch! 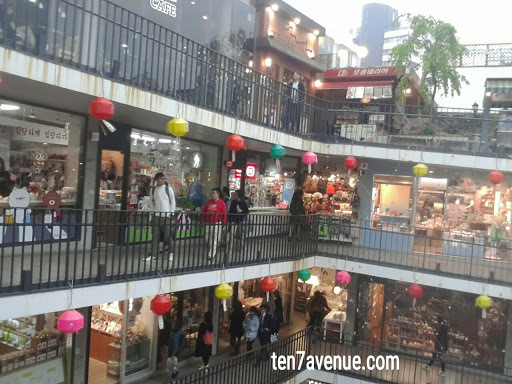 We walk around Insadong and find for a spot to eat and have some shared beer. 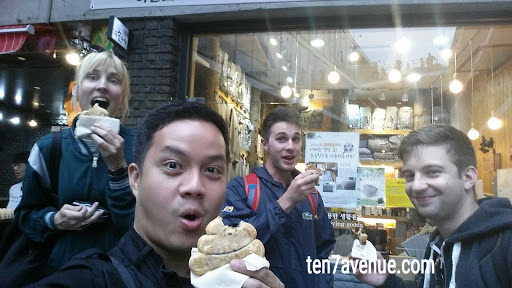 Then, after eating, tummies are full and there explore a bit in Insadong, act nuts, and ate 'poop pancake'! Such an activity for the day!!! Yeah, I enjoyed the tour and going around with some new found friends. It is cool to be a tour joiner! 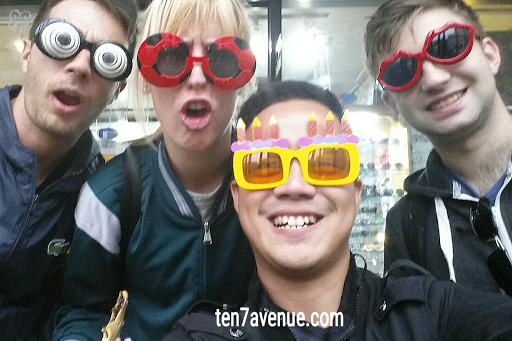 But hey, it isn't my last day in South Korea yet. I am enjoying much of the spring time. 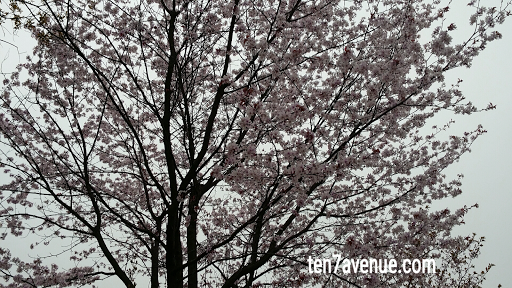 Stay put for my update and share your stories too in my avenue, www.ten7avenue.com.